Do you watch Chip and Joanna Gaines on Fixer Upper? If you answered yes, then you’re well aware of what shiplap is. If you answered no, you still might know what it is. I love watching Fixer Upper on HGTV and wish Joanna would come decorate my house. 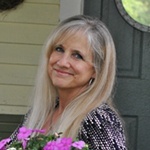 She uses shiplap freely in houses that she and Chip renovate and I think it adds charm to any room. I didn’t see shiplap listed on any interior design trends lists for 2016, but I think you’ll see more of it in years to come. When paired with pretty wallpaper, shiplap adds cottage charm to an entryway. 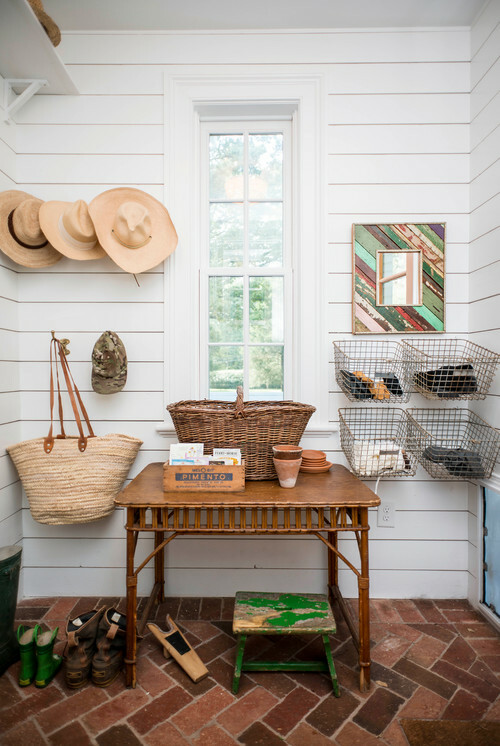 Shiplap walls in a mudroom look earthy with a brick floor. Wire baskets on the wall create easy drop-off spots when coming and going. 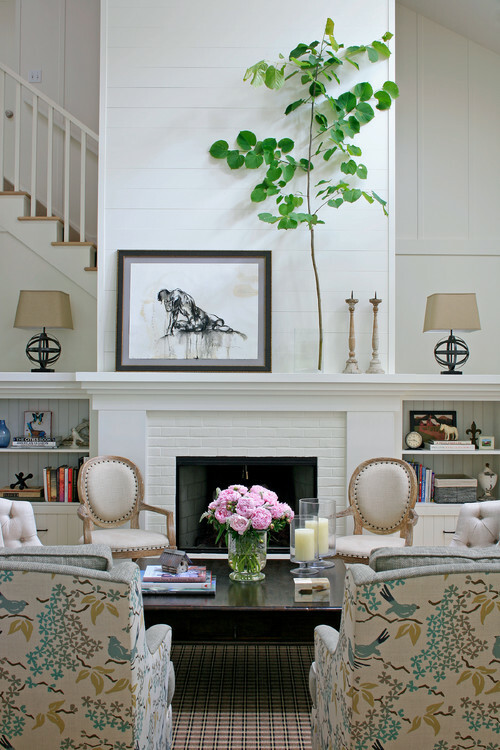 Shiplap walls create appeal all their own and don’t require a lot of artwork to make the room look beautiful. In this entryway, it pairs beautifully with architectural trim on the lower half of the wall. 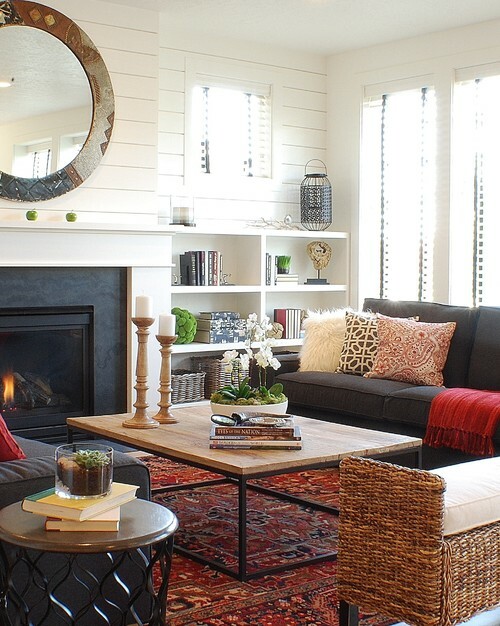 Round mirrors are a great addition to walls with horizontal shiplap. Rather than wrap a fireplace with brick or stone, why not give it a treatment of shiplap? Nothing says “farmhouse” like shiplap, and this kitchen proves you can’t have too much farmhouse style. Left unpainted, it creates rustic appeal and adds warmth to any room. 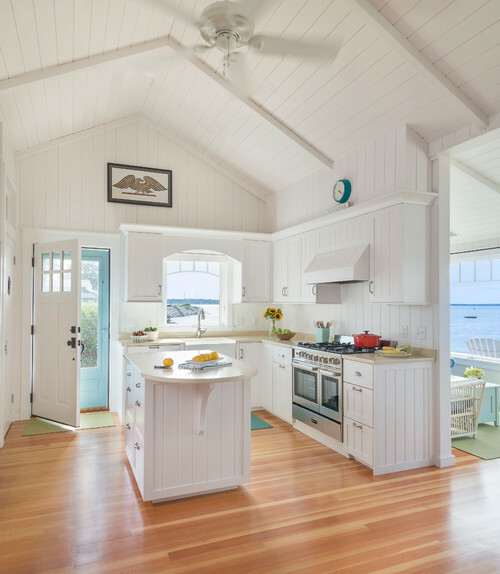 When white painted shiplap coats walls and ceilings, the result is a refreshing beach-y feel. Beach Style Bathroom by Boston Home Builders Jonathan Raith Inc.
It’s a great choice for the bathroom … and look at that tub! That’s what I call a true soaking tub! 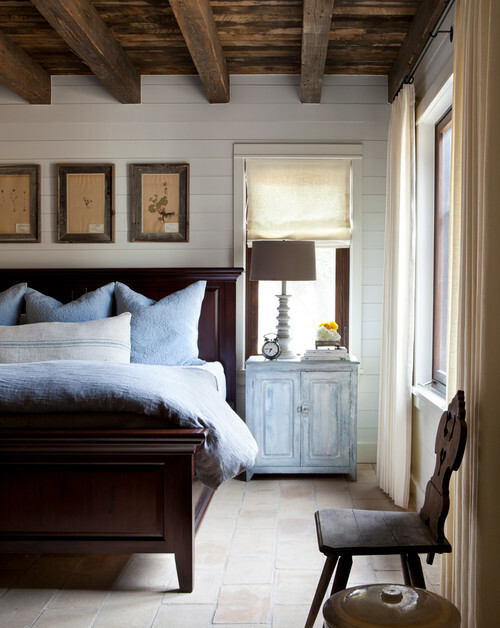 This bedroom oozes farmhouse charm with its architectural walls, pendant lighting, and an iron bed. 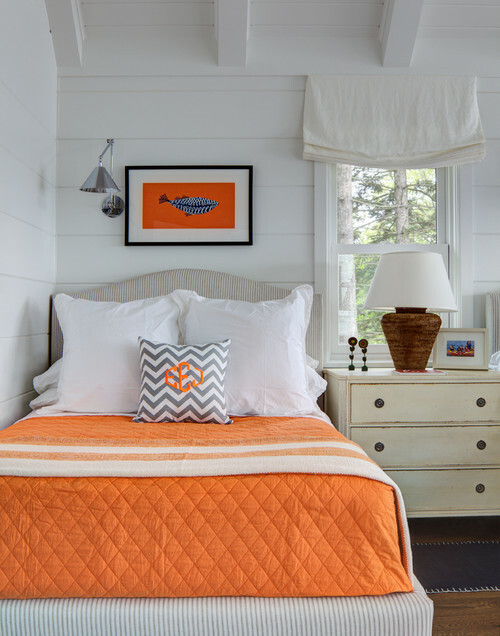 White shiplap allows fun colors to take center stage in the room, like this coastal bedroom. 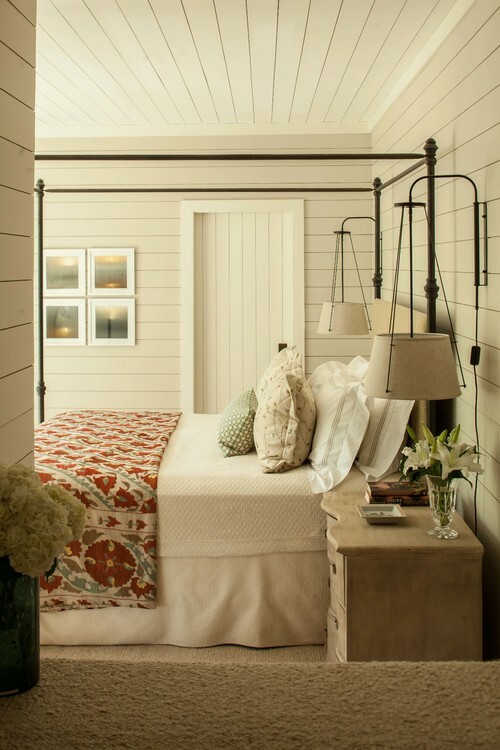 And finally, painted shiplap pairs beautifully with warm woods. 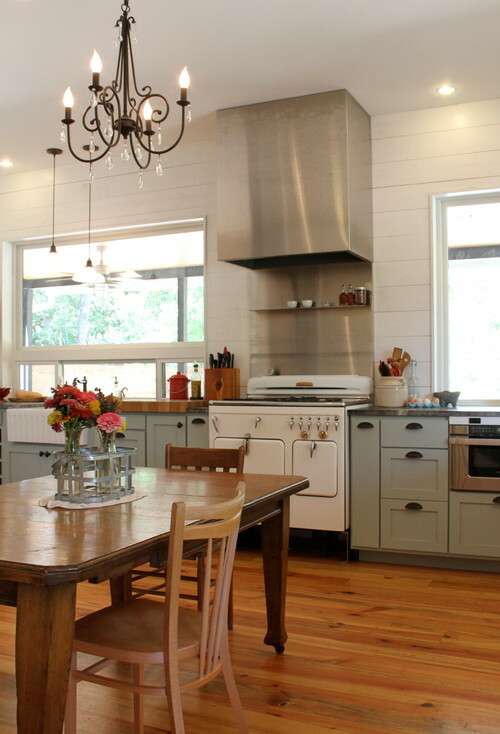 Whether you like shiplap or not, you can’t argue the transformation it lends to any room. 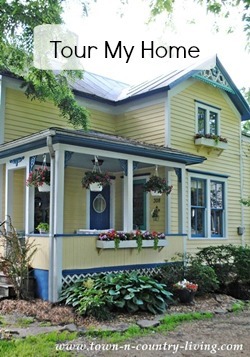 I’m hoping to add it to my home in the near future … preferably the family room where we spend the most time! I love shiplap – such a classic and cozy look. These photos are beautiful examples and they really show that shiplap doesn’t need anything added to it. Just alone it can make a space gorgeous! Fixer Upper is one of my favorite shows. They are both so sweet and I love Chip’s sense of humor! I love this post. Maybe it is because I really want to install shiplap on the fireplace wall. Thanks for the inspiration. I love Chip and Jo Gains. I never miss their show! And I love shiplap!!!! Would like to put some up in the main bathroom we are redoing. So many great examples! Thanks for sharing. I recently did a very large kitchen that had a shiplap ceiling with reclaimed railroad ties for beams. 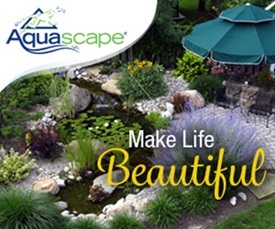 It is very popular with my interior design clients. I sure do, Jennifer! Yes, to both shiplap and watching Fixer Upper 🙂 We installed shiplap in our upstairs guest bedroom to give it character and a more rustic feel, and then painted it in an antique white color. It’s on both the walls and the ceiling. Love all the examples you shared with us, but I especially like the look of photo #1 in your post. Thanks for sharing! 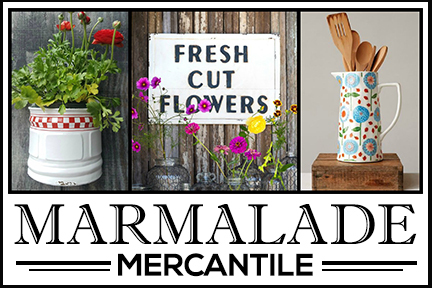 You had me at shiplap – but that wallpaper in the first photo… I think it stole my heart! We have wood paneling from the 60s in a few of our rooms. I ended up painting over it, and it looks surprisingly in style – I think I might just leave it all and paint over it until it’s dated once more, but for now, it gets to stay! Help me ?? Where did the word shiplap come from; is the cut of the wood ? Also, is there a set width of the wood. Love shiplap; just want to know how to describe. Shiplap is a wide board commonly used in barns and sheds. The boards have rabbets so that they can be overlapped leaving a distinct demarcation between boards. Check out the link below for more information about shiplap. I love Fixer Upper too. Joanna can design my home, Chip can build it, and Joanna can style it — anytime!